On 9/24/13. we unofficially predicted the Boston Marathon Qualifying Time Cutoff would be: BAA Qualifying Time - 00:01:34. See our complete methodology, analysis and results. 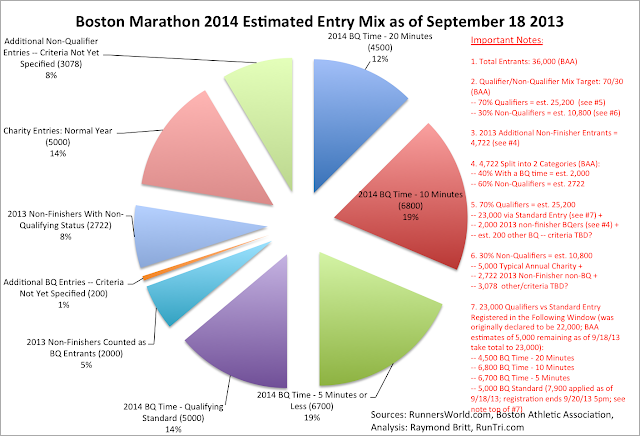 As of 9/18/13, with interest in running Boston 2014 at an all-time high, the increase of accepted entrants raised to 36,000 vs recent years' norm of 27,000, the dynamics of qualification and the entry process have been dramatic. Following the qualification entry rules at baa.org (and listed below), the rolling entry process has been underway and steady reports and estimates from the BAA and RunnersWorld.com reveal an extraordinarily complex picture of how the 36,000 accepted entrants appear to be allocated. 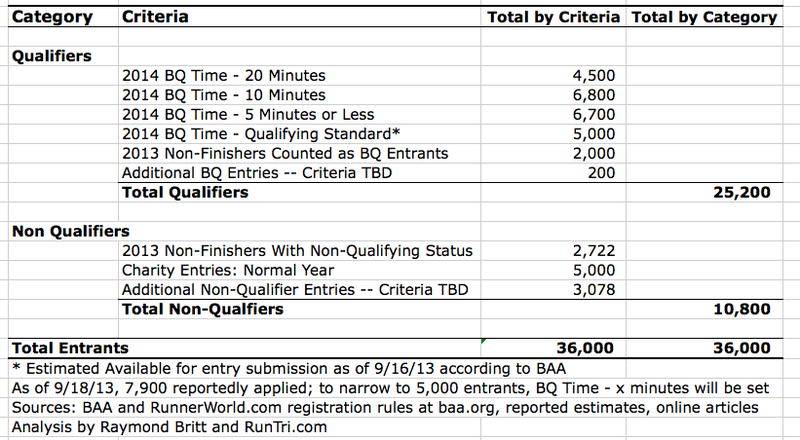 A reported 7,900 qualifiers had submitted applications in hopes of securing one of 5,000 remaining qualifying entries; when registration ends on 9/20/13, BAA will determine a revised -- faster, in 2012 it was BQ time minus 1 minute 14 seconds -- qualifying time to confirm the final 5,000 qualifying entrants. Charity entries may still be available afterwards, however. 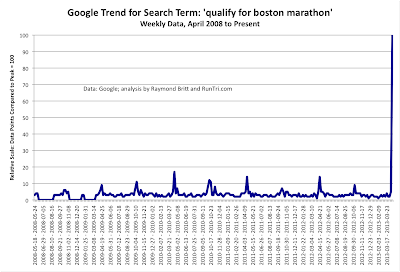 Late April, 2013: In the days after terrorists' bombs ended Boston Marathon 2013, a tremendous surge of interest in participating inBoston Marathon 2014.